Christine received a gorgeous bunch of fabric roses made up from Rosalie Quinlan fabrics and a yummy box of roses choclates from Sharon in our swap. Sharon received this lovely Rosalie Quinlan cushion made by Sue,love the colours in this cushion! And a surprise visit by Cheryl who was my lovely swap partner in last years Santa Sack swap,it was soooo good to catch up with her!! 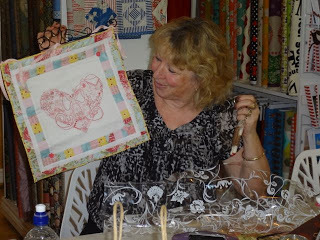 Here she is looking very happy with her wall hanging made by Tracee. Such a fun day out...beautiful swap gifts. I have loved seeing all your photos and the gorgeous swap gifts. Great day for you all. You do look like a very happy bunch - especially once you got all your lovely swap gifts! Sure looks like you all had good reason to smile. Enjoy your pretty smelling hanger. It was lovely catching up with you again Barb. So glad you like your lavender hanger. A fantastic day for everyone. Love seeing all the pics and glad everyone had a wonderful time. Looks like a lovely day was had by all.